Lot many career options are there after 12th. Marwadi University presents various career options which you can pursue under graduation. Read about such options and choose the right career path. So your boards are over and you are all set to make one of the most important decisions of your life – your career. With everyone asking you to decide upon a career path, the rush of chaos and confusion running in your mind is inexplicable. 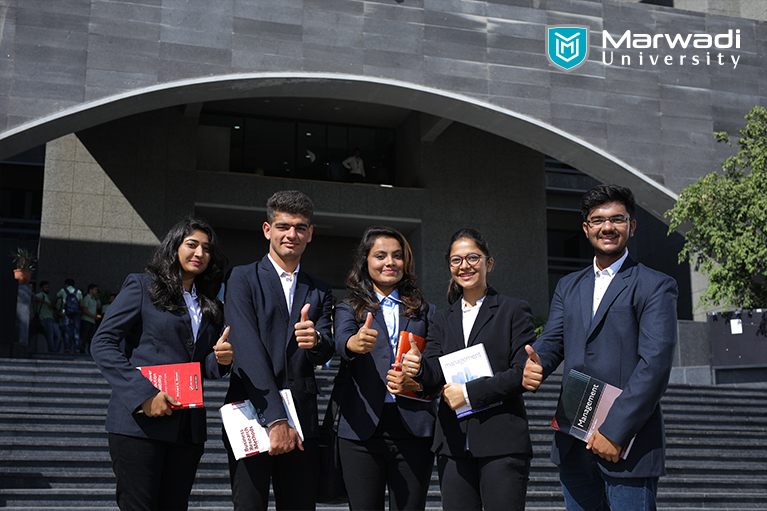 We understand that and to ease that stress, at Marwadi University, we have come up with certain options which can help you decide upon a definite career path. Explore a few such options here. Law is an attractive career option among youngsters these days. Not only does it offers a good scope of career but also provides a good source of income as well. Thus, an LLB course can prove to be an ideal choice for individuals who have an inquisitive mind and is interested in legal matters. After the completion of the course, you can choose to work in law firms, Public Sector Units (PSUs), Intellectual Property firms, etc. Since the past few years, a lot of importance is being given to research. Many government bodies across the world have been encouraging young students to pursue research by introducing a number of attractive initiatives. Thus, research has gained a lot of prominence in recent times and hence, BSc course is a good option for students who have a hunger to know everything around them. At Marwadi University, we give you a number of subjects for your specialization such as Microbiology, Physics, Mathematics, and Industrial chemistry so that you can pursue research in the field of your choice and emerge meritoriously. If you are a person who is fond of designs and numbers, then an Architecture course can be a good option for you. This course involves the study of various buildings and aesthetics along with their designing which demands precision and a keen eye for details. After the completion of your studies, you can work as an independent architect, production designer or even as a planning and development surveyor. If you have the zeal to do something on your own instead of working for someone, then a preferable choice of study will be the business management is the right choice of career for you. A course in this field will lay a strong foundation for the development of your business sense and managerial skills. Business management course at Marwadi University can help you to understand various aspects of business and management so that you can make the best decision for your business or the team you are leading. With emergence of so many life-threatening diseases around, there is a dire need for quality pharmacists who possess a deep knowledge about various drugs which prove to be useful in curing such diseases. The demand for such pharmacists has not just risen widely in India but also in abroad. Hence, the pharmacy can be considered as an ideal choice for your career. A four-year program in pharmacy can equip you with the essential skills and expertise required in this field so that you can emerge as a knowledgeable pharmacist who can excel in this field. Marwadi University offers a number of undergraduate courses of your interest which can help you fulfill your dreams without any compromise. Enquire for admission related queries today.